Chocolate Banana Bread for sale. Buy online at Zingerman's Mail Order. Gourmet Gifts. Food Gifts. A wholly different kind of banana bread. 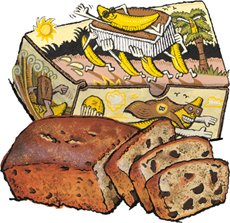 Our classic banana bread is baked with organic flour, real butter, fresh eggs, cane sugar, a touch of Madagascar vanilla and two super ripe bananas. It's great, a strong house built of nostalgia and seriously good flavor. Chocolate chunk banana bread, on the other hand, is a whole other story. The addition of fat chunks of dark chocolate, while appearing to be a simple case of gilding the lily, transforms the cake into a different dessert altogether. This is not the banana bread you made with your sister after school. There are people I know who don't like banana bread but absolutely love this one. It sounds weird till you taste it. Amazing stuff. Wanna mix it up? Try our banana bread with no chocolate in its simplest, classic recipe, or topped with a sweet and salty pecan praline.